A racy title is one thing, but what’s the book actually about? A fantail doing some of the aerial acrobatics it is known for at Anzac Park, Palmerston North. 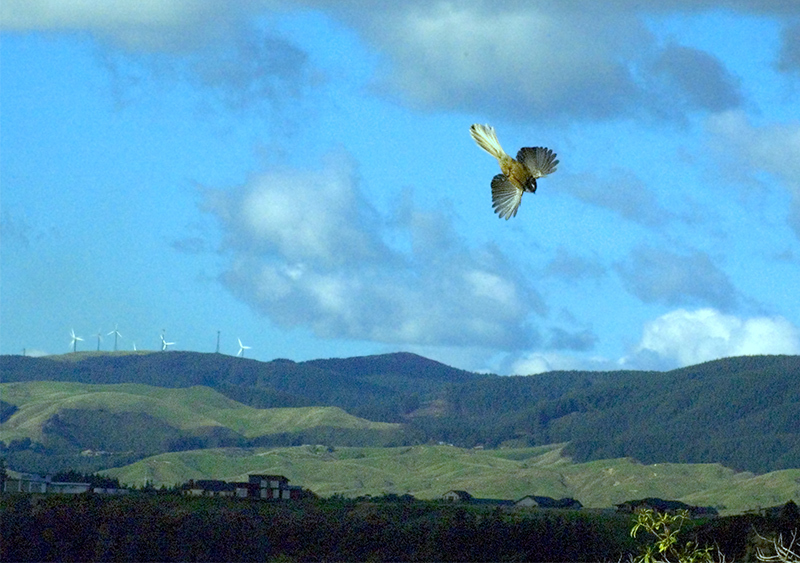 Wind turbines can be seen on the Tararua Ranges in the background. Anzac Park is a significant – but little celebrated – historical site; known as Motu o Poutoa, it was a strategically important Rangitane pa before it was destroyed by an invading tribe. Photo by Paul Knight. Few today would describe the Manawatū as spectacular or iconic – it is unlikely to adorn a tourist brochure promoting New Zealand. But behind this domesticated landscape is a story of transformation so dramatic that few could even imagine how “wild” – primeval, even – this landscape was only a little more than a century ago. Described as “waste land of the Colony” in a government announcement in 1871, the Manawatū was one of the last regions to be opened up for organised settlement. So daunting the prospect of clearing this densely forested hinterland, Scandinavian immigrants – known for their skills as woodsmen – were specially recruited as pioneer settlers. These and other primarily working-class settlers were driven by their singular desire to improve their own economic situation; there was no room for sentiment when it came to the indigenous landscape. Fire – the primary method of clearance – was indiscriminant, and wholly unpredictable in its destructiveness. By the turn of the twentieth century, most of the forest of the hills and plains had been reduced to ash, making way for farms and settlements. Next, attention was turned to draining the region’s abundant swamps and lagoons – once the food baskets of the tangata whenua – but now simply a barrier to progress. However, it was not long before the environment turned on its human occupants. With the forests and swamps gone, increasingly intense floods ravaged farmland, drowned stock and tore down bridges almost as soon as they were erected. Rainstorms cut great swathes of precious topsoil out of the hills, dumping it in rivers and streams. By the 1970s, fish were dying en-masse in the Manawatū’s rivers. It was clear that the relentless pursuit of economic progress was reaching its environmental limits, and government and scientists stepped in to “fix” the problems through engineering and scientific solutions. The 2004 storm and the devastation that ensued was a stark reminder of the limitations of human power to control and contain nature. It led to a re-examination of the balance between the economy and the environment, and a stronger focus on working with the environment in a way that recognizes its limits. This has been evident in the region’s development of a bold new approach to land management policy, but is perhaps best exemplified by the Manawatū River itself, which gained notoriety in 2009 as one of the most polluted rivers in the developed world. Nowhere else did a region’s environmental history unfold in the way it did in the Manawatū, but the tensions evident in this story – particularly between the human pursuit of economic progress and the limitations of the natural environment – are the same ones grappled with by people throughout the world. Previous Article What’s the best title? Please vote!